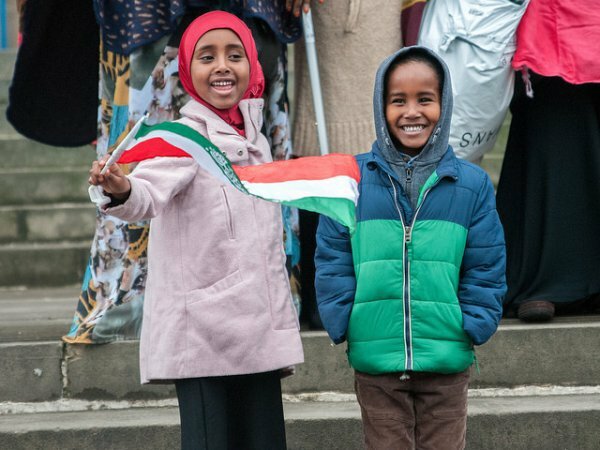 On Tuesday 15 May 2018 Somaliland celebrated its 27th independence anniversary, within the defacto sovereign State, as well as abroad in several countries where its diaspora resides. These celebrations have occurred yearly since its declared independence in 1991, following a 9-year civil war against Somali Democratic Republic military ruler Siad Barre. The anniversary parade in Hargeisa, Somaliland’s capital, was presented in front of President Muse Bihi Abdi, fellow government officials, as well as defence forces, police forces and custodial, marine and other corps. Somaliland’s diaspora members celebrated abroad notably in the United Kingdom, United States of America, Australia, Sweden, Belgium and Kenya. The Celebrations were held across the country to mark the 27th anniversary of the reclamation of independence in 1991. As usual, the main parade was in Hargeisa, was contingents from the Somaliland Defence Forces, Police Force, Custodial, Marine and other ancillary corps once again but on a great display. A 27 years later, not a single country recognises Somaliland, but this territory of about 5 million people is arguably one of the more stable, democratic places in the Horn of Africa. From the government agencies to social organisations, the business sector and all other sectors of Somaliland’s community were represented at the parade in Hargeisa attended by President Muse Bihi Abdi, government officials and opposition. The celebrations will be Demonstrating into the all over the world the great break of tradition, communities across Somaliland, and diaspora groups around the world including in the UK, U.S.A, Australia, Sweden, Belgium, Kenya.